When you think "Jack's Abby", you immediately think of a great lager. But what about a lager wine? What is a lager wine? I don't know. Depending on what site you research, Baby Maker is called a Euro Strong Lager, a Doppelbock, an English Barleywine, and God knows what else. So, what is my frame of reference for this beer? Nothing! And you know what, that's actually a good thing: going in with no idea what to compare it to. Anyway, Baby Maker (whatever it is) was aged for nine months in bourbon barrels previously used for BA Framinghammer. 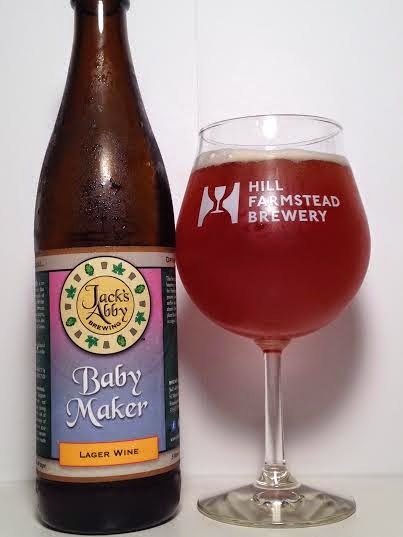 Recently, Jack's Abby released batch two of Baby Maker, but now calling in "Bride Maker" which has a slightly tweeked recipe. So, let's see how the original is before I see the sequel. Pours a hazy, dark, rusty, blood orange that is bordering on copper or amber. Got one finger of an off-white head. Woah! The aroma is amazing! HUGE toffee, caramel, and vanilla. The bourbon is right there in your face, but not with an alcohol sting, just pure sweetness. A considerable dark fruit/raisin presence and some oak too. It smells like nothing else I've ever had. Calling the taste complex is an understatement. Big caramel and toffee are my first impressions. Vanilla is an accent rather than a main ingredient. There's a large fruit cake taste which is why I can see how people would call this a doppelbock. Tons of bourbon, a little bit of oak, and some raisins round everything out. Call me crazy, but I pick up a small, almost maple flavor too. What's great is that each flavor contributes equally and none of them are fighting for attention. Frankly, it's just delicious. To me, it reminds me of a wheatwine with a think, syrupy mouthfeel. Although, this is also quite carbonated too. I don't think I've had a beer that had both. At 14.00%, I don't taste alcohol, but there is definitely a warming sensation in my chest on the finish. As thick as it is, the carbonation helps move the beer along and makes this quite drinkable. Seriously, my brain is telling me "Hey, slow down! This is 14.00%!". You could slug this down because it's so tasty, but I wouldn't recommend it. I hate exaggerating when it comes to my reviews, nor do I want to use any hyperbole whatsoever, but if someone asked me what my favorite beer was at this moment, I'm pretty sure I would say Jack's Abby Baby Maker. There is so much flavor going on here that my words can't possibly do it justice. I've never had a beer with such a complex array of flavors combined with a thick, but carbonated mouthfeel that was so easily drinkable. There aren't any more superlatives I can bestow upon it. Drinking this is downright pornographic.